ITV has rolled-out two further HD regions on Freesat, with the addition of the Central (West) and Meridian (SE) variants on channel 119, but this has caused the loss of ITV HD for some viewers. Previously, viewers in the south and the Midlands received London regional programming on ITV HD - one of just two HD regions on Freesat. Now all four ITV HD regions are available, with Freesat providing the relevant HD region according to the "advertising macro region" your ITV region belongs to. Border, Granada, Tyne Tees and Yorkshire belong to the Northern Macro region and receive ITV HD Granada. There's no change to the ITV HD service on Freesat. Central, Wales, West and Westcountry belong to the Mid/West Macro region and should now be receiving ITV HD Central (W) with West Midlands regional news on channel 119 instead of London. Anglia and Meridian belong to the South East Macro region and should now be receiving ITV HD Meridian (SE) with news from the south east on channel 119 instead of London. London remains as it was. There's no change here to the ITV HD service on Freesat. 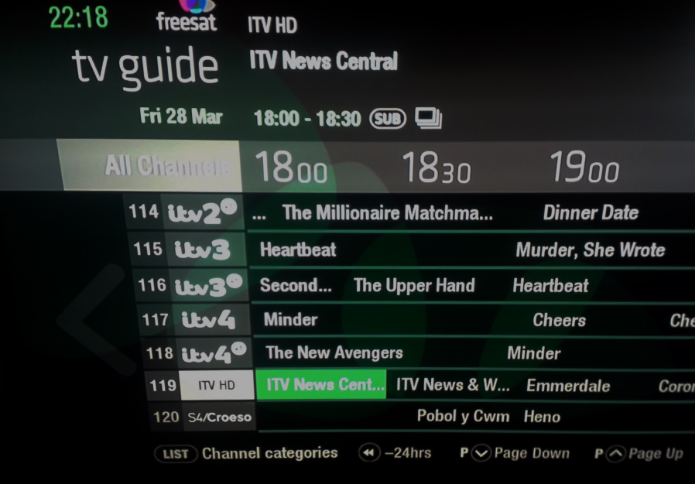 The changes to the ITV HD service on Freesat follow technical changes made to the four ITV HD regions on satellite back in February. The transition has not been smooth. Yet again, some viewers have reported that they have lost their scheduled recordings on ITV HD, and not Freesat HD boxes have automatically switched yet. a516digital observed how two Freesat receivers reacted to the change in the ITV Central region. The region change caused the Freesat Freetime HB1000S to initially lose channel 119, then stored the channel, but disallowed access to it. The box had to be switched off and powered on again after a minute to restore the ITV HD service. The Manhattan HD-S2 Freeview HD receiver failed to change the region even after a reboot and needed a rescan to provide the correct regional variant of ITV HD on channel 119. Viewers in the Midlands and southern England who have completely lost ITV HD on channel 119 (or can see the channel in the list but can't access it), should reboot their Freesat receiver. In the event that the channel does not return, you will need to do a rescan. Viewers in the Central and Meridian ITV regions, who are still receiving London regional programming on Freesat channel 119 may need to rescan their Freesat box if it does not automatically change overnight. Scheduled recordings should be checked. If lost, they will need to be set up again.